What makes an amazing photo booth hire in Scotland? My name is Ashley and as a mobile Dj I regularly saw lots of photobooths at birthdays and weddings where I was the Dj. I would often go and talk to the operators to pick their brains and ask questions about how their photo booths worked and how much they cost to hire etc. The one thing that I immediately noticed was just how small the photos they printed out were. This was particularly true when the photo booth company offered 3 or 4 small photos on a strip that were passport sized. The other thing I noticed was the way that advertising was often put through the middle of the photos making the actual image even smaller. I decided that I wanted to become a photo booth operator in Scotland and to offer photo booth hire with a difference. When I discussed with one of my friends that I was going to do photo booth hire in Scotland he told me about a printer that wasn’t the usual Mitsubishi D70 that everyone else used but a DNP 620A printer. The single biggest advantage of using this printer for photo booth hire was the size of prints it could produce. A 6 inch by 9 inch print was very easy for this printer to produce but it could do even more! It will actually do 6 by 14 prints and even 6 by 20 prints which are great if you want to do a panoramic or group shot. Once I watched a few videos on You Tube about this amazing photo booth printer I was sold. It was fast and could produce a 6 by 9 photo in around 20 seconds and the quality of print was absolutely stunning. I ordered it the next day. While I was doing my research on photo booth printers I also noticed that DNP made a wireless hub that you could connect a mobile phone too wirelessly by Bluetooth. This really interested me as I take great photos with my iPhone camera and could see the possibility of taking photos at weddings with my iPhone and printing them out for the bride and groom. I decided to add that to my order and waited for it to arrive. Once I had bought my printer I needed to find the right photo booth. There were so many choices. Some with DSLR cameras and lights that attached above the booth and others with these huge metal structures which took ages to assemble and looked overly complicated and a bit old fashioned I thought. I read about a new product that had been launched that used an Apple IPad at its heart. One commentator said this would be the death of all the other photo booths and was going to be “the Photobooth to hire”. I started to look into the advantages of this technology and who made the best version of this IPad type photo booth. Once again I asked my colleagues in the disco industry who also did photo booth hire and everyone said buy the one that a company called “Big Fun” make. I asked why and everyone said that their after sales service was incredibly good and that was it for me and I looked into buying one. I looked on their website and found this very sleek looking photo pod photo booth. I liked its sleek lines with the light and IPad built into the steel case and the fact they provided flight cases and everything you needed to take your new photo booth out for hire. 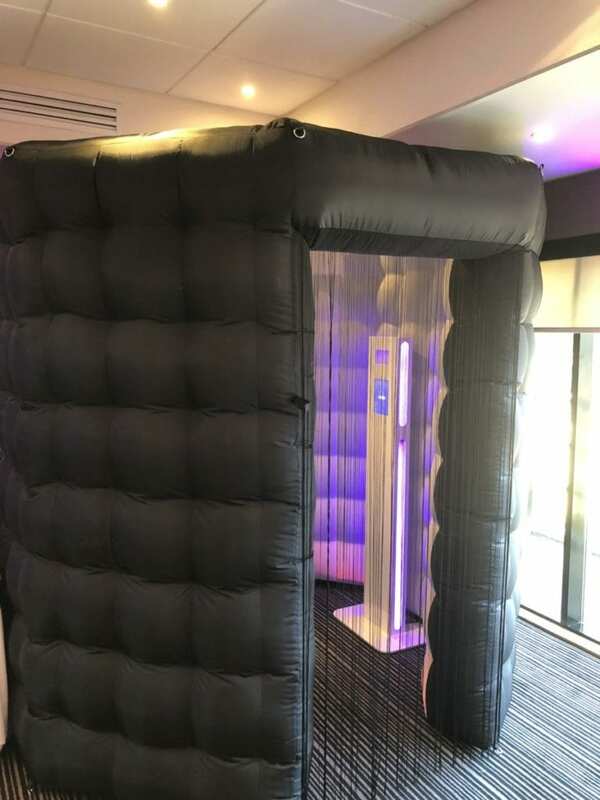 One option you could get was to have led lights down the full length of the sides to light up your inflatable photo booth. It added a nice touch to the photo booth and that’s the one I went for. You could also add a cabled connection to your printer via a laptop and I got that too. My next stop was to order a really good flight case for my very expensive DNP 620A printer. I called Swan Flight who manufacture flight cases and a few days later my custom made case arrived and I was just about ready to start doing photo booth hire throughout Scotland. The last part I ordered was the inflatable photo booth. Over the previous few months I’d seen lots of these and lots of them that wouldn’t inflate properly, looked dirty and I wanted to get something much better. I didn’t like the white square shaped booths as they became dirty very easily and everyone seemed to have them. I wanted something decidedly different and unusual as my inflatable photo booth. This is the one I bought and I’ve had so many compliments about it from people I’ve hired it to. I liked it being jet black with a grey interior and it’s string doorway which is just totally different from anything I’d seen before. The fact that it was an octagonal photo booth was nice too and not just square like every other one I’d seen. That was it, all the parts of my photo booth had been bought and it was time to connect them all and see how to make them work. A few calls to Chris at Big Fun and it was working and I was just totally blown away by the huge 6 by 9 prints and how I could personalise the photos by using the photo media booth app to add the birthday boy or girl’s name or the happy couple’s names and the date of their party. My friend Paul also made me lots of incredible skins for backgrounds etc and start up screens which just made it look amazing. When I bought the photo pod part of my photo booth I didn’t realise just how much more it could do. It doesn’t just print out your photos but you can send them to your friends by email or post them to Twitter, Instagram or to your Facebook page. You can also share them using Apple’s airdrop system. The possibilities were just endless and I was very impressed. I took my photo booth for its first hire and I knew in minutes that I’d made the right choice by going for the bigger print size of 6 by 9. My customers were all absolutely gob smacked by their sheer size and the quality of the photographs. That first night I gave out dozens of business cards to brides wanting to hire me for their wedding. Every hire I did after that I heard the same comments about how huge the prints were from my photo booth. I’ve done photo booth hires from Inverness to Gretna Green and from Edinburgh to Stranraer. I think the best testimonial for how good my prints are is that none are left on the tables at the end of the night. Everyone takes them home. I provide several optional extras when I’m doing photo booth hire. The most popular has to be the photo frames that I sell for just £1 each. I have three different borders on them, Black, Silver and Gold. When you buy a frame you get a nice see through plastic bag designed for holding your photos. 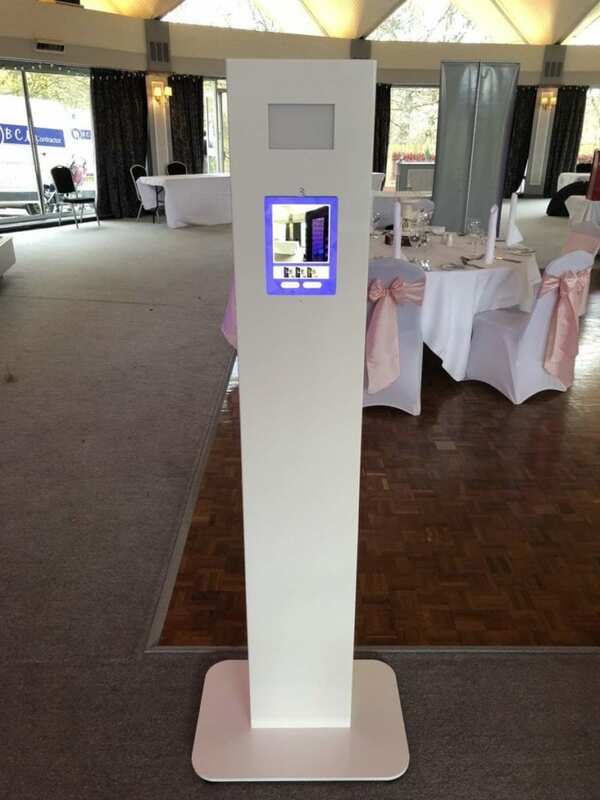 Another optional extra is to have all your photos put onto a flash pen so you have an electronic copy of every photo that was taken during your photo booth hire. I charge only £20 for this and you get a San Disk flash pen not a cheap and nasty one. I can also send you all the photos that were taken electronically by sharing a Dropbox link that goes to a folder I create in Dropbox just for your event. This is provided free of charge with your photo booth hire. You also get a copy of your photos put into an album and your guests are asked to print an extra copy of their photos so you get a copy. The photo booth supervisor will put those in a beautiful white photo album which takes 100 of the huge 6 by 9 photos. At the photo booth hire I did in Gretna Green I actually had to supply a second album as the photo booth was such a huge hit. With a Photobooth hire from me you get unlimited 6 by 9 prints and at an 18th birthday party in Castle Douglas we set a new record for the most amount of prints in one night just beating the wedding I did a photo booth hire for in Gretna Green. I always take lots of spare ink and paper to every photo booth hire just in case. At least 4 spare rolls of paper and ink. After doing photo booth hires throughout Scotland a new update to the photo media booth app was launched. This took things to a whole new level as you could now add a variety of props like glasses, hats, wigs, moustaches etc electronically to your photos. You just clicked the one you wanted and it would appear on your photo and you could drag it into position on your photo. Using a pinch gesture you could make the prop bigger or smaller and move it so it was in the right position. They also added the facility to write on your photos using your finger. You could write messages on your photos or sign them. It just made the whole experience more fun. Talking of fun, I almost forgot to mention our two boxes of props we bring to every photo booth hire. We have lots of hats, wigs, moustaches, glasses, feather boas, inflatable microphones, guns, guitars etc. I think this is probably one of the most fun things you can do with a photo booth hire. My guests just love doing crazy things with the props and the photos are really fun! You can of course take serious photos too. If your party has a theme I will invest in some props that suit your theme. Setting up the photo booth takes around 30 minutes with the inflatable photo booth and less if you just use the photo pod. I do an incredible offer with my photo pod if you’re hiring a disco from me. You can have it for the whole night for just £99. You don’t get any prints but everyone can share their photos on line and the person whose party it is gets a digital copy of every photo taken. This gives you lots of great memories from your party or wedding. In order to make the social media side of the photo booth work we need an internet connection. This can either be the venue’s WI-FI network or on 3G or 4G using one of my phones. If no WI-FI is available and no 3G or 4G it’s not a problem as soon as I switch the Photo booth on in an area where there is an internet connection all the photos are then sent. The prices I charge for photo booth hire are very reasonable. 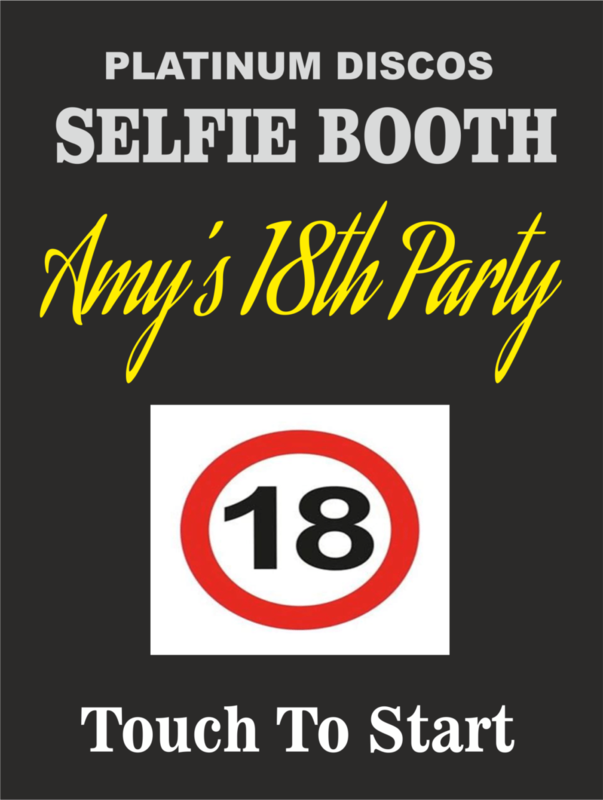 A two hour photo booth hire is £250, a three hour hire is £300 and a 4 hour hire is £350. Additional hours can be bought for £50 per hour. I’ve kept the prices very reasonable especially when you consider that my ink and paper costs will be two and half times more than anyone else’s because my prints are two and a half times bigger! Once you’ve seen the sheer size and quality of my photo booth prints and the beautiful inflatable photo booth itself you’ll love it as much as I do. I never tire of hearing my guests telling me how amazing my photo booth is and that they want to hire me. If you have a wedding or party coming up give me a call on 07472 287 151 and I’ll tell you more about what my amazing photo booth does and email you some example photos. You can also contact me through this website using our contact form. I answer enquiries very quickly and will come back to you with prices and availability in just a few minutes. 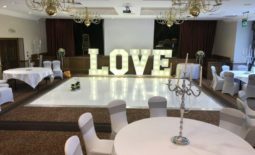 10 Things You Need To Know About Photo Booth Hire	Mood lighting and uplighting hire in Scotland.